Good morning. This little hobby of a motorcycle blog logged its 1 millionth viewer today. Woo hoo! Unfortunately there will be no falling balloons, bells and whistles or motorcycle give away as it’s a low budget operation. There once was a time where I thought a million was a massive amount of views. At one point I had “Content-Creation Madness”… thinking that all I had to do was post new content every day and then sit back and watch the hordes of new readers and the corporate decision makers find me. I watched and waited for my clout score to skyrocket. And in today’s social media over hyped up marketing world with the aggregators, intermediaries and pyramid viral tricks, I’m now thinking that I should be asking why is it only a million?! If you were to benchmark entertainment or compare this blog to other viral legends like Susan Boyle, Lady Gaga, Old Spice Guy and Rebecca Black it’s really nothing but a dismal failure. 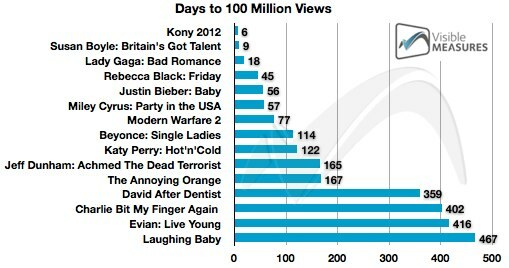 For example, let’s look at the number of days it took each of them to reach 100 million views: Susan Boyle did it in nine. Lady Gaga’s Bad Romance, which currently has over 900 million views, took 18 days. Rebecca Black’s Friday, currently at 430+ million views, took 45 days. Even Justin Bieber’s Baby, which has topped 1.1 billion views, took 56 days, one day faster than Miley Cyrus’ Party in the U.S. Even Modern Warfare 2, one of the biggest entertainment gaming launches ever, hit 100 million views after 77 days. I won’t go through all of them, but you can see how long it took some of the biggest viral names ever to reach 100 million views in the chart above. This blog is about one-tenth that amount. Yeah, I know it’s not an A-to-A comparison, but a million views is hardly a blip on the score board these days when you contrast it with entertainment. In the beginning, the plethora of content distribution “paths” once exited me. I developed a Twitter feed. I started a Facebook feed then stopped it due to privacy concerns. Early on I caught the eye of some savvy social media folks at Harley-Davidson who were convinced that product reviews (HERE) were the wave of the blog future. It wasn’t. I developed an iPhone app for mobile users. There was even a shout out from the reality series man himself… Kurt Sutter (FX – Sons of Anarchy) HERE. Then there was the Daily Newspaper (HERE). Most of these were all attempts to help scale out the blog or content reach. 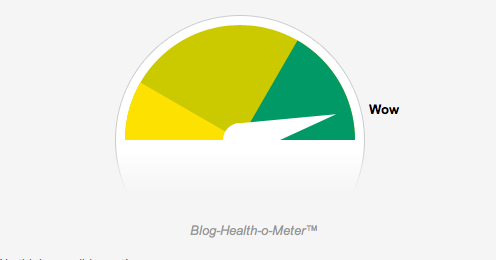 Now, I realize that much of the blog content is landing in the “cloud dumpster” and I no longer think “view statistics” are a good gauge of a blog. This blog has never been about attracting leads and transforming them into customers. Customers of what? I don’t sell anything so creating content for each stage of the buying process (awareness, consideration, and decision) is silly. 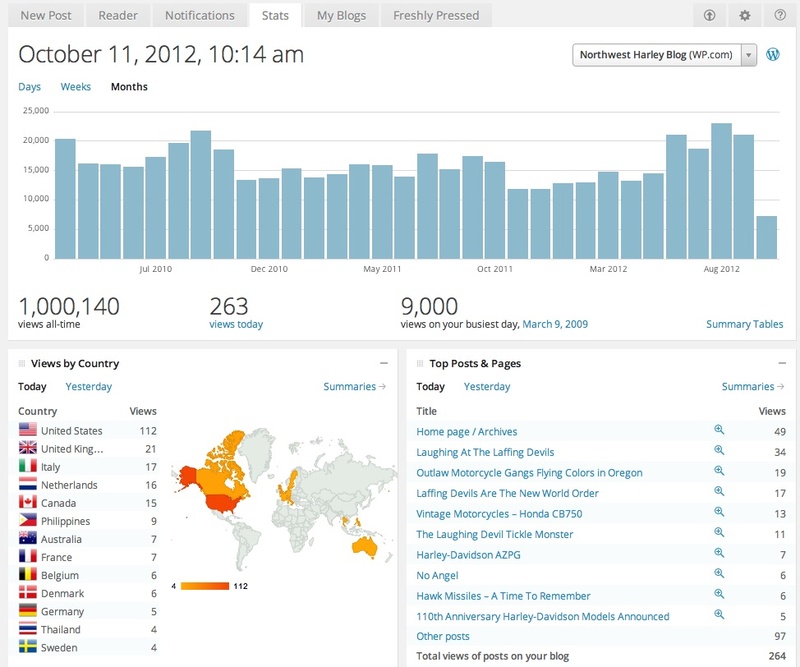 The characteristics that make for a great blog are typically never tracked. Clarity – Is the blog/author clear about details such as the time period and subject. Who or what does it apply to and are there updates to the information as new data unfolds over the days/weeks ahead. Content should appear or link to many forms, ranging from videos, infographics and/or links to legal or report summaries. Credibility – Is the information the author posted derived from sound research and is the methodology related to the facts. Is the article sharing an opinion or is just biased? Is the blog nothing but a repost-er of previously reported news articles or does it provide commentary and analysis of the potential impact to the motorcycle community? 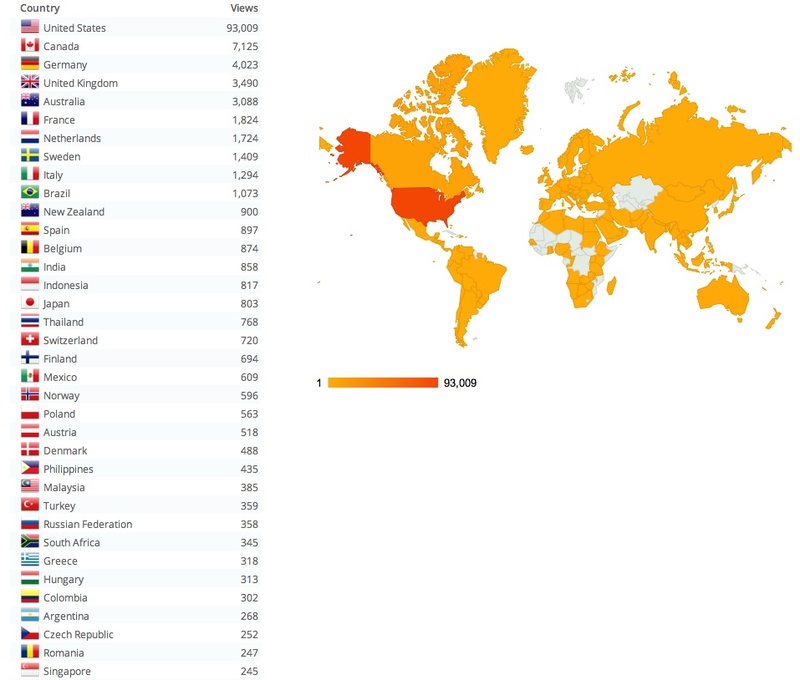 Though I generally don’t hold to a “hits mean much” worldview, I’m intrigued by the search results that send readers to the site and that readers are coming to this blog from all continents including places that I wouldn’t have thought — for example: Afghanistan, Iraq, Nigeria and Guam. The point of this post today is to say that I appreciate all the readers who’ve joined in the discussion on this blog. More importantly I’ve realized that some readers had better ideas than I or had important insights that I wanted to share. The blog has evolved a bit from my original intention and is far better. I learn every day and for that I thank you. Photo courtesy of Visible Measures and WordPress.